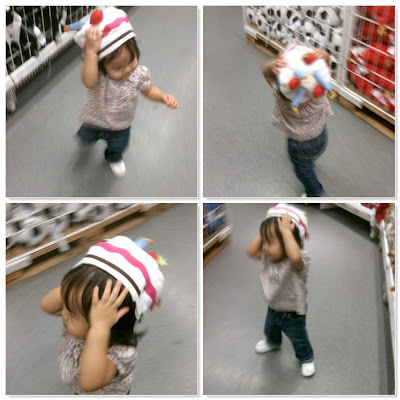 It was another outing to Ikea and we found that they now have these really adorable hats for kids. They come in all sorts of irreverently fun designs. Birthday Cake (complete with 3 candles), Viking Helmet (? ), Ladybug, Flower on a grass patch, Aeroplane etc. Some even had matching eye masks to pull the look together! I couldn't resist putting a hat on Bubbles. She started running around the moment she had it on, as if to put it on a test drive. Zoom zoom zoom, as fast as her little legs would take her, stopping occasionally to hold the hat in place. She seemed to be programmed to take off every time I managed to set my phone's camera to focus! We must have been a funny sight! Bubbles is sooo cute and such a nutter. She and Ry should meet and burn off some energy!! haha, I too need a new compact camera! Which one are you thinking of getting? Now I usually resort to using my iPhone. The DSLR gets used only at home or when Roboman is out with me. Oh really? Haha! Well I never bothered much about the toy section before Bubbles came along! Still, they must have kept the hats for a bit because we're at Ikea pretty often and I've never seen them! haha yes! I often call her my cheeky monkey. She's usually only this way with people she is very familiar with though! Oh yes, I'm sure those 2 girls will have a blast! DD is eyeing the Canon S95. He's partial to Canon, you see. From what he tells me, it's got great low light performance and shoots HD video. (Those are the only points that interest me!) I think it also offers quite a bit of manual control (which is the part that interests him) and takes good macro shots. The reviews are also excellent and DD liked the camera when he tried it out. Guess we just have to get round to buying it! Maybe you can also check it out.